How often does anyone get an opportunity to camp out with lions, tigers and bears (including a pretty happy grizzly bear named Stanley)? On Nov. 22, you can at Elmira’s Wildlife Sanctuary. Mitch Traphagen file photo. Are you ready to experience camping in a different way? How about camping out within yards of more than 40 various exotic animals such as a lion, tigers, bears and more? Well, here is your chance. On Saturday, Nov. 22, Elmira’s Wildlife Sanctuary is hosting its very first camping event, Sleepover With Stanley. Enjoy the sanctuary at the animals’ favorite time of day — night! You will experience the first night tour ever and see the animals by moonlight, enjoy a family movie on the lawn with popcorn, plus games, drawings and prizes. On Sunday morning, guests will be treated to an enrichment tour where the animals will receive new treats and toys such as pumpkins and piñatas. Saturday night dinner and breakfast on Sunday are included. Setup starts at 4 p.m. Saturday. Bring your tent, sleeping bags, flashlights, bug spray, appropriate shoes and clothing (it could get chilly at night), etc. Tickets are on sale now, so don’t wait. Participation in this event is limited to the first 15 registered tents (4 people per tent). No campfires or alcohol will be allowed. Prices: Adults (over 12), $65 donation per person; children (ages 6-12), $30 donation per person. Prices include a 5-inch-by-7-inch photo of your family in front of their young grizzly bear, Stanley, and a goodie bag. All donations go directly to the care of the animals. Tickets can be purchased through their website — www.elmiraswildlife.org — or mail a check or money order, along with the names and ages of those attending, as well as your contact information, to Elmira’s Wildlife Sanctuary, PO Box 63, Wimauma, FL 33598. You can also stop by the sanctuary on Saturdays or on Sunday, Nov. 2, to register. Space will be awarded on a first-come, first-served basis. Please make a note if you would prefer a vegetarian meal. For questions, email info@elmiraswildlife.org. 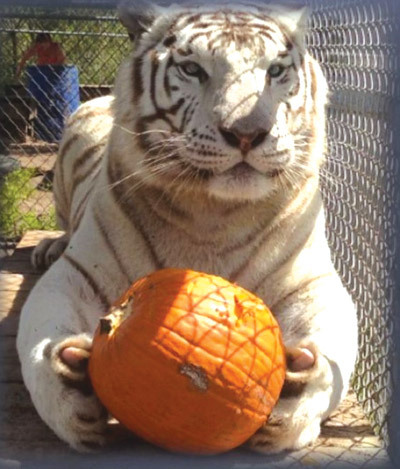 Shadow, a white tiger, seems very fond of his pumpkin. Photo courtesy of Elmira’s Wildlife Sanctuary. 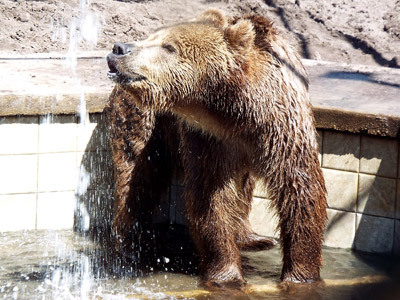 Stanley is a two-year-old grizzly bear who loves his pool, his toys and his caretakers at Elmira’s Wildlife Sanctuary. 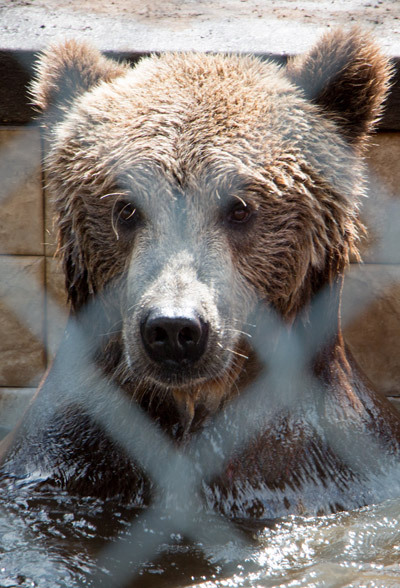 On Nov. 22, you will have the opportunity to camp out with him at the sanctuary (he’ll sleep in his own cage rather than a tent). Photo courtesy of Elmira’s Wildlife Sanctuary.